The optimism of nineteen walkers was well rewarded this Saturday when a misty start to the day’s excursion turned into hot sunshine by its end. Jim was first to arrive, with Robert, followed by Robert (Rab) Simpson who was a visitor and whose mum lives in Creetown. Soon afterwards Ken, Margaret, Audrey, Mary Sloan, Graham (with beard, not seen him for ages), Florence and her friends from the Dales, Judy and Mike then Leslie, Cath, Catherine, Forbes and Isobel arrived. I introduced my friends, Shirley and Carol, who were staying with me for a week. I eventually managed to gather them all together, between all the cars and introduced all the visitors before leading them all through the garden to the back gate, forgetting to tell them anything about the walk! 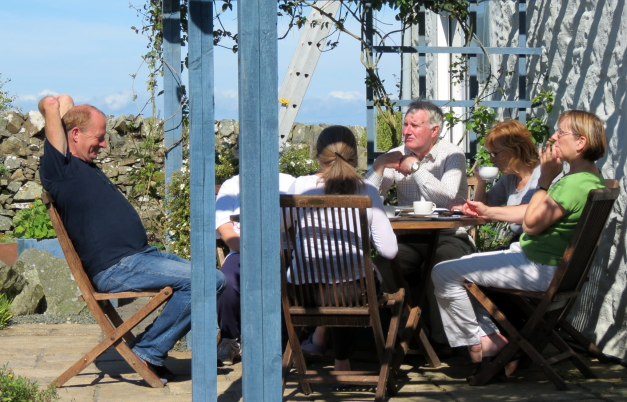 A stroll around the beautifully kept garden of the walk leader at Damnaglaur began what was to be a ramble of continuous delights. The flocks of geese, turkeys and hens at Buckie Knowe along the road, together with various breeds of sheep, gave an interest which was heightened when the old track across by Kildonan croft was taken, with great views down to the little harbour of Drummore, now filled with the incoming tide, shining in the sun. The school road was climbed to the church on the hill, the Kirk Covenant, so named because it was built in the year of the signing of the Covenant, 1638, to replace the old Kirkmaiden kirk, the remains of which are to be seen on the Mull farm. A diversion into the graveyard was taken to inspect the memorial to those who died on the SS Main, which was torpedoed by a German submarine in 1917. The ship was raised and visitors were allowed on board for a small fee, the money was used to pay for this memorial. 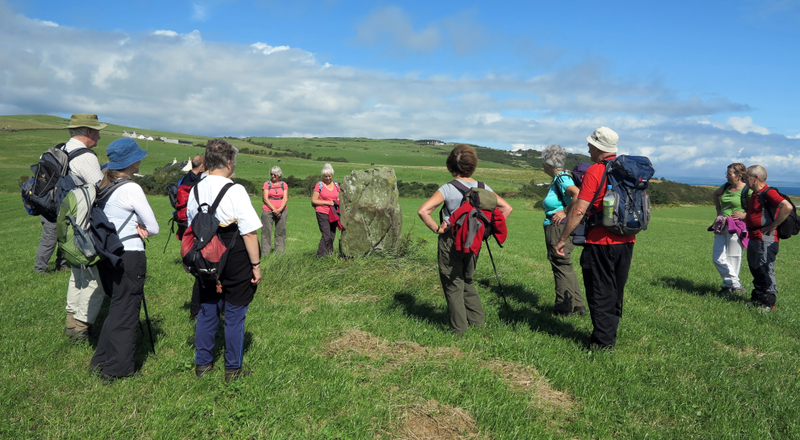 Now the walkers took a route down the dappled Glen Road and across a field to view the standing stone near Kilstay. This is thought to mark an early Christian site and burial ground which is adjacent to another early church recorded nearby. 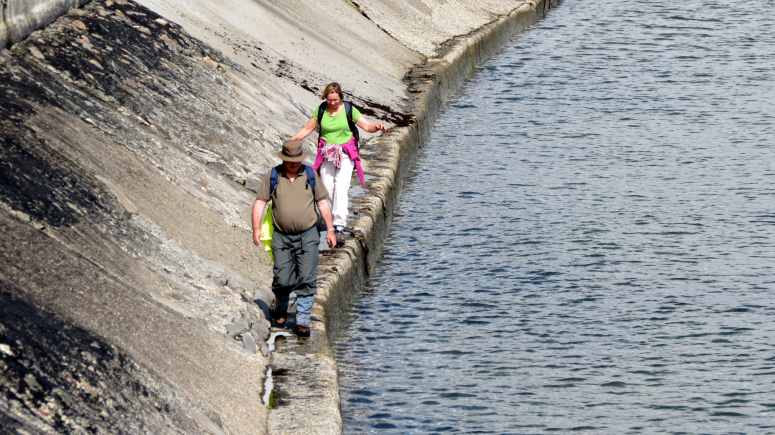 A little dog thought to join the walkers just at the corner, but was deterred by its owner, and the sea wall was taken to by well-balanced people for the next stretch of the walk, which now took the route of the new coast path. 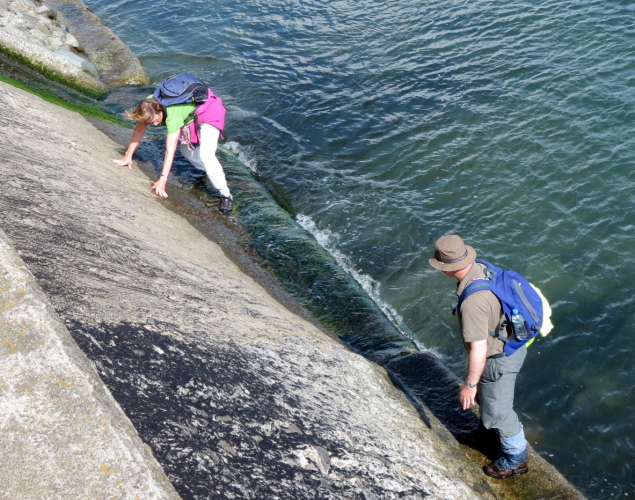 The walk went mostly to plan except that Forbes and Carol opted to walk along a ledge below the sea wall which was great for a while and then became REALLY difficult as the ledge narrowed and even got covered by the sea and seaweed! They had really wet feet for the rest of the walk! 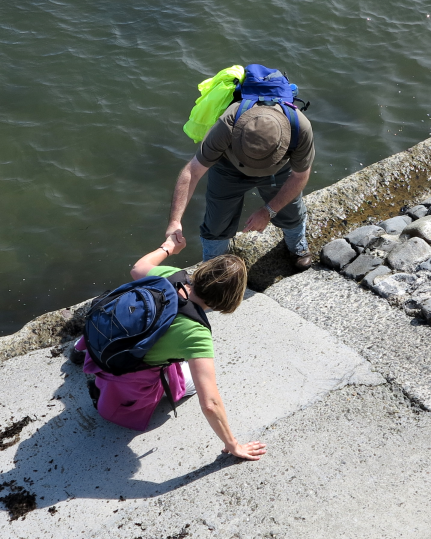 Entertainment was provided by a couple who walked along a ledge above the tide, which was not deep at this point, but gave a few wet feet before the road was once more gained. 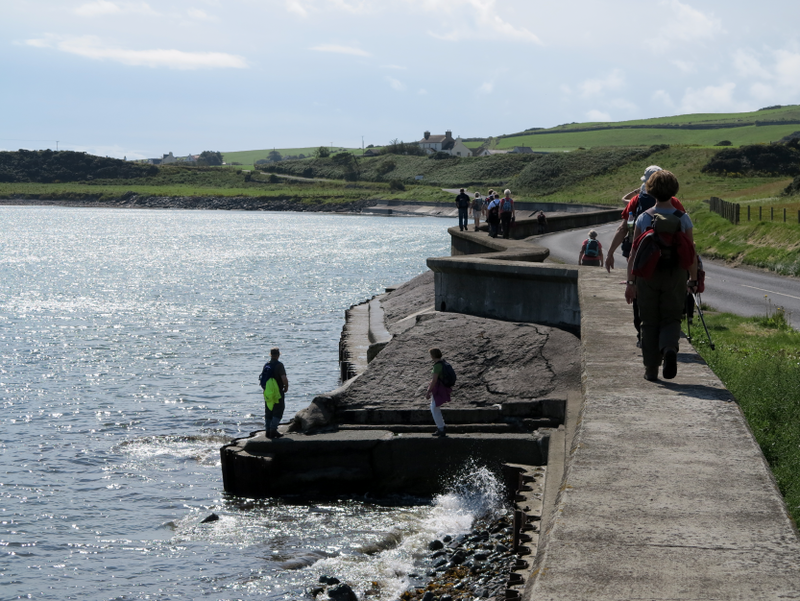 A colourful garden at the entrance to the village was inspected and the abandoned shore road was followed past flowery and picturesque cottages, now a quiet corner fronting the sea. The harbour, with a half built or half demolished shed spoiling the view, was passed, and an old eighteenth century mill inspected, with its wheel and fast flowing water from the leat still intact. Along Cailiness road a picnic site with comfortable seats on the beach welcomed the ramblers for a lunch break, a pleasant interlude with birds flying low over the water and the rushing music of waves close by. A path cut through rampant wild flowers, including the now seeding cups of wild carrot and stands of aromatic mugwort, provided an interesting specimen of ‘robin’s pincushion’ on a wild rose – a hedgerow gall, looking like a mossy ball, which is caused by the minute gall-wasp which lays its eggs in the rose bud in spring. 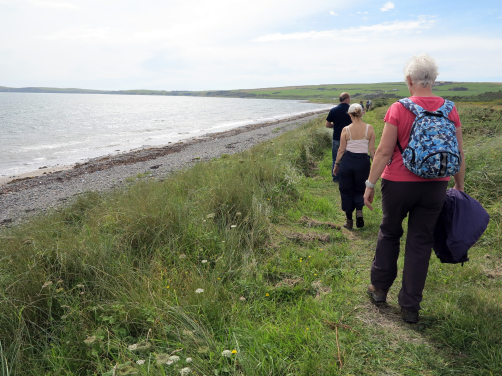 The caravan site at Maryport was soon reached and the new coast path was left, to climb steeply uphill up past Creechan Farm, the exertion rewarded by splendid views over to the Mull and its lighthouse. 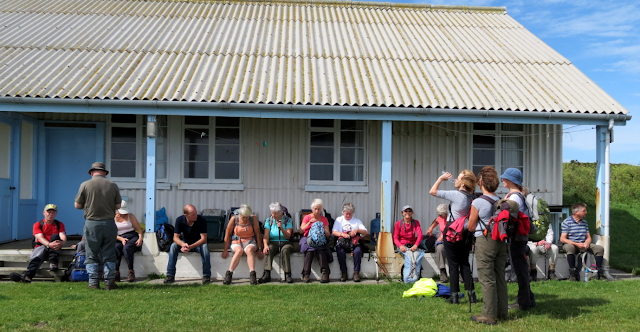 We took advantage of the veranda at the ‘shack’ at Maryport to have a rest and for the walkers to catch up before we went through the boring and deserted caravan site. 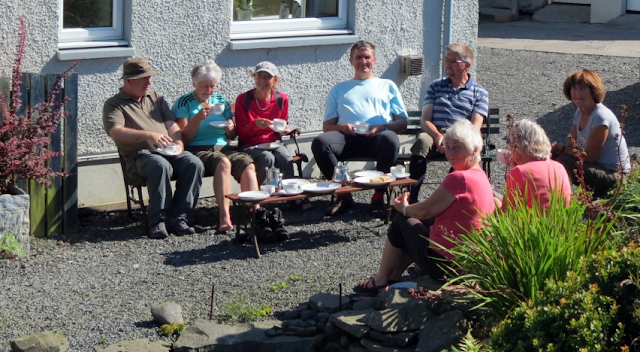 The slog up from the site was followed by the lesser but longer one up to and through Creechan, with a stop to view its lovely garden from where there is a fabulous view across to the Mull. Now it was only a short distance through a field which, just a few days ago, had just been the stubble after silage but which was now very green and often boggy, and along the road back to Damnaglaur where delicious tea in the sunshine awaited hungry walkers, having completed a most pleasant and relaxing circular excursion in the southernmost part of this area. I got lots of help especially from Shirley, Carol and Audrey, making drinks and cutting, buttering and putting jam on scones before we sat outside, joining the others in the sunshine. It was a lovely relaxing time and I enjoyed showing Catherine around the garden.